Imagine if there were an elegant luxury sedan on the market that boasted both unbridled power and penny-pinching fuel efficiency. Well, stop imagining, and start test driving the newly revamped 2016 Toyota Avalon Hybrid. It combines all the splendor and elegance of the Avalon with the efficiency of a Prius, without sacrificing one iota of Avalon's formidable power. In other words, the Avalon Hybrid has everything you want in a roomy, limousine-like sedan, except for those frequent stops at the gas station. How can a fuel-efficient hybrid engine move a full-size car along the highway so smoothly? It took Toyota over 30 years of global day-and-night research to come with the answer. The Prius hit the market over 20 years ago, and most of them are still on the road today. We invite all our friends and neighbors in Charlottetown, Stratford, Mt. 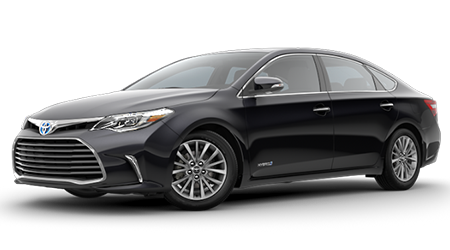 Herbert, Cornwall, Marshfield, Brackley, and Milton Station to visit our modern showroom at 1 Superior Crescent Charlottetown, PO BOX 730 in Charlottetown,PE, and see the 2016 Avalon Hybrid in its best light. If you are interested in a high-class hybrid that handles like a souped-up dream and thumbs its nose at gas stations, the Avalon Hybrid may be the game-changer that finally convinces you to go green. There is only one way to find out for sure. If you live in Charlottetown, Stratford, Mt. Herbert, Cornwall, Marshfield, Brackley, and Milton Station, PE drop by Charlottetown Toyota at 1 Superior Crescent Charlottetown, PO BOX 730, PE for an exhilarating test drive of the 2016 Toyota Avalon Hybrid but remember to bring your coolest sunglasses!